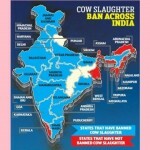 The recent notification brought out by the Government of India banning sale for cow slaughter is extremely commendable. While the merits and the supporters of this laudable measure are not being brought much to the fore, it is ardently the opposition that is receiving much undue attention. The uproar against this notification is an example of the opposition to Hinduism as a way of life. Since time immemorial, India has been worshipping cattle. They have always had a dominant role in the worship, rituals, temple culture, agriculture and foremostly formed the backbone of each household and the economy as a whole. Among all, cow holds the most significant position. The British realized this, and it is then that cow slaughter was made legal in the state of Bengal by Robert Clive. The recent notification brought out by the Government of India is extremely commendable, and is indeed a first major step in the urgent need for the protection of the bovine population. While the merits and the supporters of this laudable measure are not being brought much to the fore, it is ardently the opposition that is receiving much undue attention. The uproar against this notification is an example of the opposition to Hinduism as a way of life. In no other country is such brutal cruelty practiced against cattle as in India. For the past 1000 years, not thousands, but tens of lakhs of people, mainly Hindus have either died or been killed in their pursuit to protect cows or stop cow slaughter in this country. However, no one seems to talk about it. 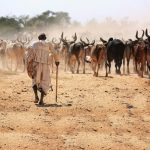 Through the past millennia people have given up their lives in the ongoing fight to stop cattle slaughter. Whether it was the Muslim onslaught, Muslim rule, British rule or independent India, the fight still goes on, but unfortunately however daring, sincere are the efforts, they have massively failed to bring about a radical change. The original Vedic culture in this country has been tarnished, but the efforts to bring back the iota of that glorious past continue persistently and shall continue till there actually comes about a visible change. One of the major arguments against the case is that people have a right to choice of food in this country namely as a fundamental right. Rights only can be in accordance to the basic law of the land and the culture of the soil. A noble, innocent and a pious animal that has been of extreme use to mankind along human history and has been revered and worshipped throughout Vedic scriptures and in recent history certainly cannot be mercilessly killed and eaten as a result of dubious arguments. A choice of food can only be allowed as per the purview of the basic culture of the land and soil. How has India forgotten the roots of her ancient, glorious culture. The culture of this land is certainly not to barbarically kill a revered pious creature, spread her blood, eat it, export it and get money from export of meat and leather of slaughtered animals. So great is the culture of this land that has accommodated people from all races and religions through the centuries, it is everyone’s duty living in this land to respect the culture of this soil to protect the cow and her progeny. Even heads of Muslim religious leaders and organizations have been asking for a ban on cow slaughter, but some small section of people with their vested interest are creating a furore about it. 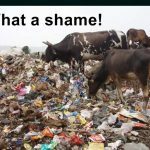 Another argument goes by that when cattle become old and are rendered useless, they become a burden on the economy. Hence they should be slaughtered, eaten and exported. Then a similar argument should also apply to human beings. Since morally and legally this cannot be allowed, then how can such arguments hold good for cows who have served humankind for their entire lifetime, and how, when in old age they need shelter and care, can they be sent away for slaughter? Isn’t this one of the most basic ethics of humanity? Many of the farmers in India treat cattle like their family members and do not wish to dispose them off. Also, selling cattle for a meager sum of Rs 5000 to Rs 20000 does not overall improve the economic condition of just anyone. 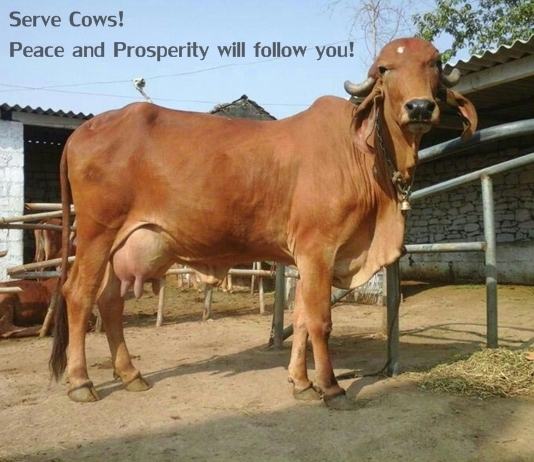 While humans may become unproductive in their old age, it is the greatness of the cows to still remain useful, even if the utility has reduced, by virtue of their urine and dung, that are widely used in Hindu samskars and ayurvedic medicines. Nuclear holocaust effects are also majorly set off by covering walls by cow dung. Citing economic reasons, cow slaughter was never prevalent in the history of this country. Then what had made India the richest country in the world, full of wealth, gold, rich in traditions, values, culture, and most importantly economic wealth? It was certainly not cow slaughter. Wild animals as tigers, lions are also unproductive to the nation. Then why are similar arguments not given for their slaughter and what makes them so protected? Black buck and similar species are also protected, since they are endangered. 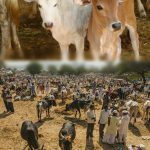 The point being made is, if cow slaughter remains rampant in its core, a similar situation shall soon arise for the cattle species of this country, since a few hundred of the originally Indian species have already been wiped out completely. How does a greatly capable country like India imagine earning foreign exchange by malpractice of export of beef and animals for slaughter and. A similar argument should also hold good for the malpractices of human and drug trafficking. Since they are legally and morally not allowed, on similar lines cow slaughter and export should be legally and morally banned. It is anyway morally banned in Hinduism, religion, practices and Indian culture. 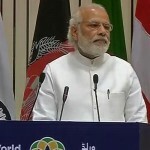 India must take the effort to make it a legal crime disregarding the boundaries of the states. India has always been capable of rising from ashes. Each plunder of its soil by the invaders made India lose its culture, riches, monuments, heritage, animal and human population. However hard was the fall, cruel the rampage, India has always succeeded in getting back on its feet and rebuilding its lost treasures. The Hindu culture and heritage of most countries was lost as a result of the Muslim invasions. But since it has been said that India witnessed the most ruthless and brutal invasion, still India has been able to preserve its old, rich Vedic heritage and culture to date. Even though it is a miniscule of that original glory, the original Indian culture still remains. In the past various malpractices have come up in the society that have been eradicated by the ruling governments from time to time. Even the British banished the extremely prevalent customs of child marriage and sati at that time. So, after the rampant onslaught of the Muslim invaders, British and other rulers, leaving their marks on the customs and society at large, some segments of the population have become habitual to these practices. Hence it is finally the time to put an end to this evil that has exceeded its boundaries once and for all, disregarding the furore that it may generate. Stating that the states can follow their own laws disregarding the Central law shall bring forth a distant chaos , with each one following their own ideologies, shall emerge as seeds for the ultimate disintegration of the nation. There are various debates on the muslim customs of triple talaq and the like. But there seems to be no argument against the torture that animals are made to go through in the process of Halal. How does an animal who is made to go through a most gruesome death, draining all its blood in the most barbaric form be acceptable in a civilized society? The buffalo calves that are made to stand in a line see the fate of the ones that are ahead of them, and literally tremble with fear, but to say the least, they accept unwillingly their miserable destiny. If various countries as Russia, some African nations and communist nations have also banned cow slaughter completely, why cannot India? Most importantly, it is the divine law of the land that comes the foremost giving each being born on that land a right to life. Calves have a right to drink their mother’s milk, cattle have a right to be protected in their old age, they have a right to life, food and shelter. A highly useful creature who has maintained her status in not only the ancient religious Hindu scriptures, but also in the hearts and homes of millions of true Hindus have a fundamental right to be protected and right to live. Cattle are homeless in this country. This fact does not give anyone, whether the owners, butchers, smugglers to just slaughter them. The Directive principles of state policy direct the states to “protect and preserve cattle”, which certainly does not mean “right to slaughter”. Slaughter is not a constituent of the term “preservation”. Trying to find out ways and means to justify illegal and immoral vested interests certainly needs to be prevented. The foremost step in this regard is the construction of cattle sheds for old cattle by the centre and states as has in reality been directed to the states via the principles, the construction of ideal goshalas in each district of each state, making of uniform laws through the states in this regard. Collaboration with some rich temple trusts and non-profit organizations with humane approach shall in a major chunk eradicate this cruelty and evil practice of cow slaughter in this country.